[/caption] 8365′ Mt. 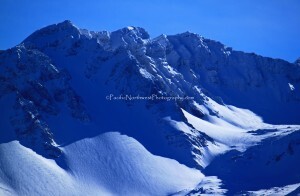 St. Helens is an amazing place to visit on a sunny winter day. However, these days can be far and in between. I was fortunate enough to be visiting during a day that offered very few clouds. Gazing up at the mountain, as seen from the south, makes it look like a giant ice cream cone with the numerous rock outcropping protruding out as though they are nuts you find in rocky road ice cream. 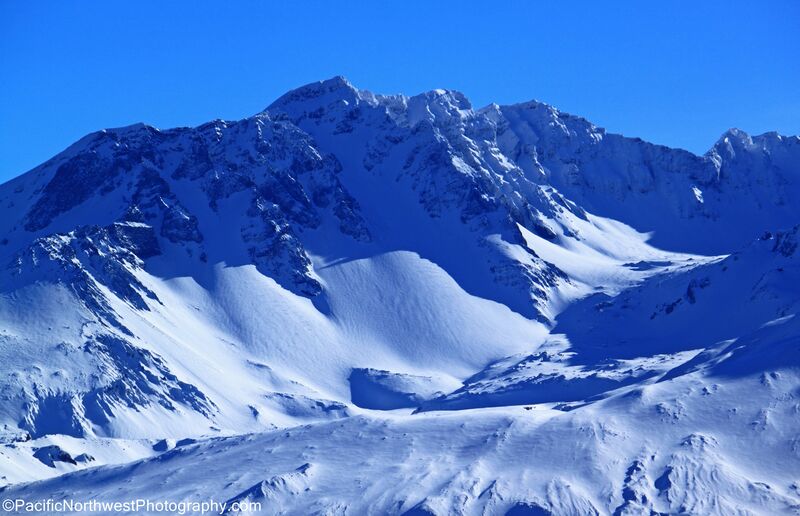 As you ascend towards its summit you will be able to get spectacular views of Mt. Adams in the east and Mt. Hood looking south. 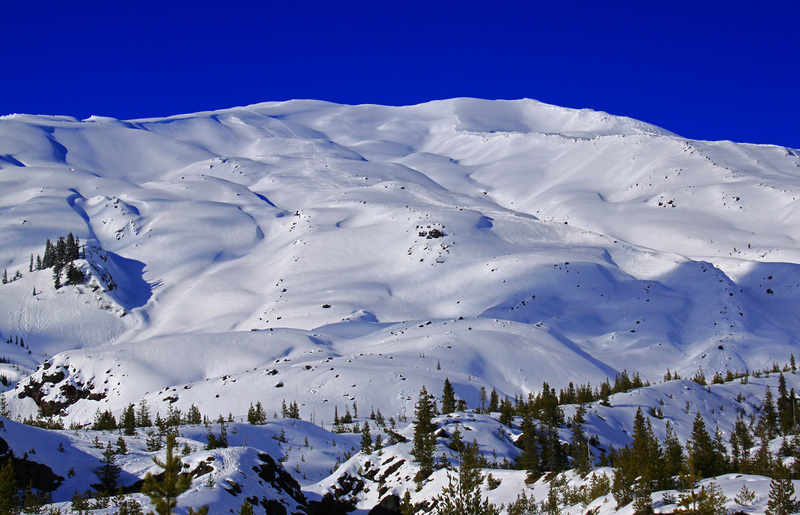 I’ve never climbed to the summit but I would have enjoyed snow-shoeing parallel at the higher elevation even more since there are so many crags lingering along the volcano. This photo was taken at about 6000′ and if you look closely you can see all of the snow-shoe tracks lurking all over the mountain. Unfortunately, on this day I got a very late start and had already spent the good part of the late morning snow-shoeing in the lower elevations. My food and water rations were low and I was pretty well spent. To get this shot I was using my 18-55mm Canon lens and attached my warming and CIR-PL filter to help saturate the blue sky and reduce the harsh glare created by the snow. I had to set the white balance to +0.7 so the snow wouldn’t be underexposed as well as the blue sky. The focal length was at 46mm and I was able to keep the field of view high in order to eliminate any blur other than the tree in the lower part of the photo. I wasn’t using a tripod on this day since I figured that the bright sunny skies didn’t warrant the need but I wished that I had. However, I was moving so much and I was always on very uneven ground that I probably wouldn’t have used it very much. I had the camera mode in Normal/Program mode so the aperture was at F-8 and the shutter speed at 1/160 second. Because it was later in the afternoon when I took this shot, you can see some of the shadows lingering over some of the snow covered crevices in the higher elevations. [/caption] This photo was taken near the Windy Ridge viewpoint on the north side of the volcano. There is a large parking lot and an easy trail that takes you to a great vantage point. You can see Spirit lake directly below you as well as Mt. Rainier in the distance. You can also see Mt. Adams to the east and Mt. Hood looming in the distance to the south. Mt. 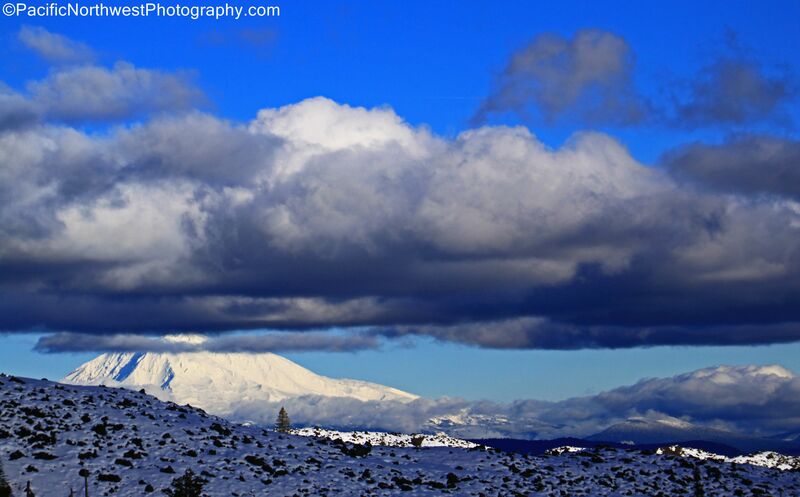 St. Helens is so close that you can almost reach out and touch it. This photo was taken at the viewpoint. I took this photo on 7/14/10 at around 6:10pm so the winds had picked up and the sun was pretty intense in the horizon. My CIR-PL and warming filter helped soften the glare from the sun and mountain as well as bring out the shadows along the volcano. I set the ISO to 100 and the white balance to -1.3 in order to limit any additional overexposure. I had the camera mode in Program/Normal mode so the aperture was set at F-5.6 and the shutter to 1/250 second. I was using my Sigma 50mm macro/prime lens as I was trying to focus on the top left of the foothills near the base of the mountain. You can see most of the glaciers and late summer snow accumulations looming in the distance as well as some of the moraines dotting the mountain. I highly recommend visiting the north east part of the Mt. 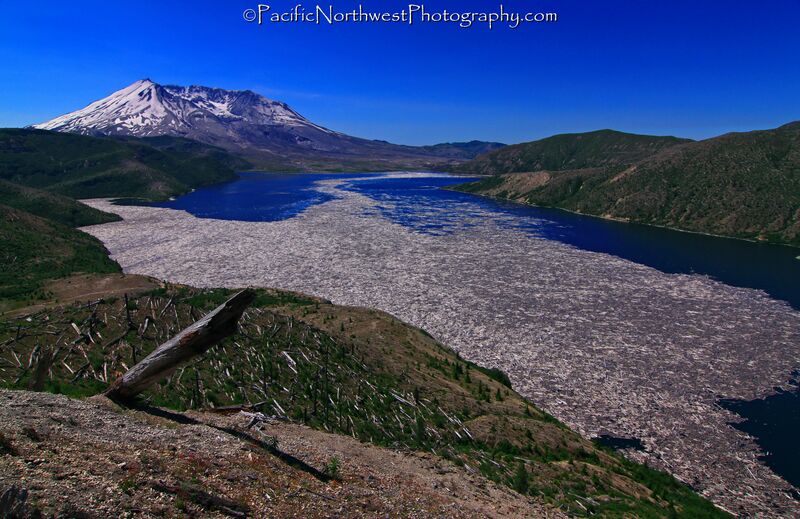 St. Helens National Volcanic Area but be prepared for a long drive with no towns in the immediate area. There are views of 4 volcanoes, an abundant of summer wildflowers, herds of elk, rivers, creeks and waterfalls as well as a short trip to the base of Spirit Lake. You will experience a truly scenic and magical place that is almost impossible to capture in a photo. [/caption] One a sunny day you are able to see as far north as Mt. Rainier and as far south as The Three Sisters. There is a secret vantage point where you can get one of the most spectacular views of the Washington and Oregon Cascade mountains. You can read about this place on my article that I wrote on 6/14/10. Late Spring is my favorite times to hike along the foothills of the Cascades since the mountains still have an abundant of snow as well as in parts of the lower elevations. The creeks, alpine lakes and smaller rivers are also swelled to the brim with runoff. You can also still witness many of the spring wildflowers basking in the warm sun. The air is also more pure and less polluted. The views seem to be never ending during the months of May and June. I took this shot on 6/12/10 and I was using my Canon EOS T1i along with my Canon 18-55mm kit lens. I attached my warming filter as well as my CIR-PL. I also used my tripod, bubble level and remote switch in order to avoid any camera shake since it was a bit windy and my footing was a bit sketchy. The sun was a bit low since it was about 5:30pm and the sun was directly behind me. You can clearly see Mt. St. Helens, Mt. Rainier and Mt. Adams in the distance. The field of view is large as well as the depth of field which makes this shot especially appealing since there isn’t any blur in the foreground or background. I set the focal length to 35mm in order to include each of the mountains without reducing the focal length anymore than I needed to. I would have tilted the camera lower in order to include less of the sky but the forest trees were so low that it would have caused the depth of view to be too soft. The camera mode was in Program/Normal so the aperture was set at F-6.3 and the exposure speed at 1/80 second. I set the ISO to 100 and the white balance at -1 in order to keep the shot as sharp as possible.